Editor’s Note: When you meet David Wagner you will not forget his sun tanned face. David, a Paralympic gold medalist and the top-ranked quad wheelchair tennis player in the world has held this spot for 7 years. Listen to him as he tells his story in his own words. Hello my name is David Wagner. I have a C-6 incomplete Spinal Cord Injury. In the summer of 1995, after my second year in college, a friend of mine and I decided to take a summer trip to California. We were planning on surfing with friends. We had been in California for three days when my life changed forever. Redondo Beach is the heart of the Los Angeles South Bay where many sports enthusiasts go to catch the perfect wave. It was a Monday. My buddy that I was staying with had to work so he dropped me off at the Redondo Pier. I recall tossing the Frisbee out into the ocean then racing towards it. On one of the tosses I was running out into the ocean to retrieve the Frisbee and as I jumped the wave it broke and hit my legs - bending my body downwards, like a jackknife, slamming my head into the ocean floor and instantly breaking my neck. The sixth vertebra broke in my neck leaving me paralyzed from the neck down. I laid there, motionless, in the fetal position. The ocean tossed my limp body around. My friends along the shore realized something wasn't right. My buddy grabbed me and drug me to the beach where I laid unable to move any part of my body. Fear of the unknown was instant because I had conclusive idea what had happened. I had played sports all my life. I knew what sport injuries felt like. And this just felt strange. The only thought I had was a sting ray had stung me, temporarily paralyzing my lower extremities. I kept waiting for my body to recover. At the time of impact my arms had been paralyzed too. As I laid on the beach I remember finally being able to move my arms. I remember this vividly because I was able to shade the sun from my eyes with my arms. In what felt like a matter of seconds, a lifeguard was there securing my head and neck, and minutes later an ambulance and paramedics were by my side moving me onto a backboard and strapping me in for stabilization. I was rushed to Harbor - UCLA Medical Centers emergency room. 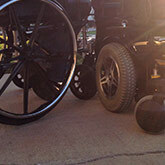 My life before Spinal Cord injury was a life spent outdoors. I was born in Fullerton, California and my family moved to the Pacific Northwest when I was two years old. I grew up in the Pacific Northwest and enjoyed the outdoors for as long as I can remember. My family first moved to Oregon from California. I spent six years in Grants Pass. My mother and father divorced when I was eight years old. My sister and I lived full time with my mom and would see my father multiple times throughout the year. My mother decided to go back to school. During this time, we moved to Corvallis, Oregon where my mom attended Oregon State University. After graduating my mom remarried and we relocated to Walla Walla, Washington where I spent my pre-teen and teen years. After high school I attended College in Walla Walla earning a Degree in Early Education. It was at college where I tried another sport, men's tennis team. I had never played tennis before but I made the team and earned a scholarship to play tennis. I was hooked on tennis and fell in love with the sport. And then that day in the summer of 1995 happened. While I was in rehab, one of the activities they had for me to do was table tennis or ping-pong. I really enjoyed it. It was a lot of fun and it was something I could do with my able-bodied friends again. 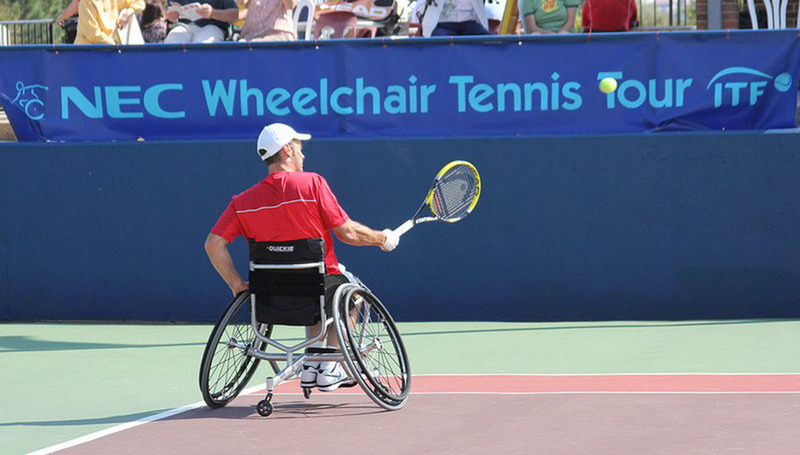 In 1999, I saw an ad for a wheelchair tennis clinic in Beaverton, Oregon and I thought – boy, this sounds like a lot of fun. I loved tennis before. At the time I was dating a girl and we thought it would be a lot of fun to go practice for this camp we were going to. Now mind you--I was out there in my every day chair – no sports chair specific. No strapping. Nothing on. I was holding the racket with no assisted device, with hands that are partly paralyzed. As soon as the ball would hit the racket, the racket would fly out of my hands. My thoughts--there is no possible way for me to hold it. I just kept saying, there is no way a quadriplegic plays wheelchair tennis. Thankfully, I didn’t believe that – I just said it. I did learn how to hold the racket. I use athletic tape. I tape the racket to my hand, so it is stuck in one grip the whole time. It never changes for the duration of my training or my match – and that could be an hour or three hours. The key is you adapt. You make do with what you have based on your disability. That’s exactly what I did. I didn’t let it stop me. 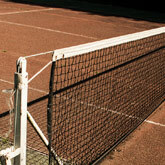 My love was tennis and I found that again – just in an adaptive way. And that was the beginning of my tennis career…..
Editor’s Note: David Wagner has so much to offer. We are honored to have the opportunity to follow his journey and look forward to sharing more of his achievements here in the BardCare Community. Keep checking back!